MONMOUTH JUNCTION, N.J., April 19, 2016 - Tris Pharma, Inc. ("Tris") announces today the launch of DYANAVEL™ XR (amphetamine), CII, the first and only extended-release liquid amphetamine for the treatment of Attention Deficit Hyperactivity Disorder (ADHD) in children aged 6 years and older. DYANAVEL XR is now available in U.S. pharmacies by prescription only. Once-daily liquid DYANAVEL XR helps doctors customize the dose for each appropriate child with ADHD to balance symptom control and side effects. The starting dose is 2.5 or 5 mg, taken once daily in the morning with or without food. The low starting dose may be adjusted by 2.5 to 10 mg per day, every 4 to 7 days, up to a maximum dose of 20 mg per day. Doctors may be able to adjust the dose within the same prescription. Prior to prescribing a central nervous system (CNS) stimulant, including DYANAVEL XR, a healthcare provider should assess for the presence of heart disease. "DYANAVEL XR was evaluated in a laboratory classroom setting in children with ADHD aged 6 to 12 years and was shown to improve attention and behavior and helped decrease impulsivity and hyperactivity," said Ann Childress, M.D., lead investigator and President of the Center for Psychiatry and Behavioral Medicine, Las Vegas. "DYANAVEL XR demonstrated a statistically significant difference versus placebo starting at one hour and lasting up to 13 hours after dosing, as measured by the Swanson, Kotkin, Agler, M-Flynn, and Pelham rating scale (SKAMP)." DYANAVEL XR received approval from the U.S. Food and Drug Administration (FDA) in October 2015. Based on limited experience with DYANAVEL XR, side effects appear to be similar to other once-daily ADHD medicines with the same active ingredient. The most common side effects reported in the Phase 3 controlled study were epistaxis (nosebleed) (DYANAVEL XR 4%, placebo 0%), allergic rhinitis (4%, 0%) and upper abdominal pain (4%, 2%). "We are proud to be the only pediatric company in the world to launch an extended-release liquid amphetamine that provides ADHD symptom control from breakfast through homework time," said Ketan Mehta, President and Chief Executive Officer of Tris Pharma. "Tris Pharma remains committed to bringing age-appropriate formulations to market to address unmet medical needs for pediatric patients." 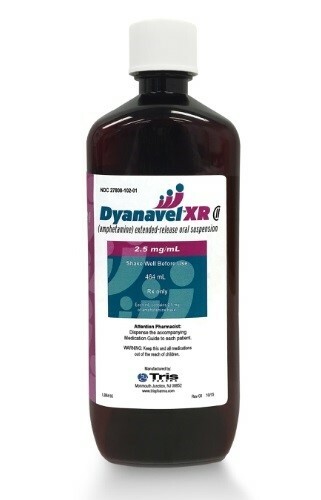 DYANAVEL XR is a central nervous system stimulant prescription medicine. It is used for the treatment of Attention Deficit Hyperactivity Disorder (ADHD). DYANAVEL XR may help increase attention and decrease impulsiveness and hyperactivity in patients with ADHD. if you or your child have circulation problems in fingers and toes (called peripheral vasculopathy, including Raynaud’s phenomenon). Fingers or toes may feel numb, cool, painful, sensitive to temperature, and/or change color from pale, to blue, to red. Call the doctor right away if any signs of unexplained wounds appear on fingers or toes while taking DYANAVEL XR. For additional safety information, click here for Full Prescribing Information, including Boxed Warning about Abuse and Dependence, and Medication Guide. 1Visser SN, Danielson ML, Bitsko RH, et al. Trends in the parent-report of health care provider-diagnosed and medicated attention-deficit/hyperactivity disorder: United States, 2003-2011. J Amer Acad Child Adolesc Psychiatry. 2014;53(1):34-46. 2American Psychiatric Association. Diagnostic and Statistical Manual of Mental Disorders. 5th ed. Arlington, VA: American Psychiatric Association; 2013.